Ever since The Wolf of Wall Street came out in 2014 to critical acclaim, there have been a handful of films attempting not necessarily to ape the visuals of that film, but at least ape its core theme: the easily corruptible debauchery and poisonous excess that comes with the classic ideals of the American Dream. 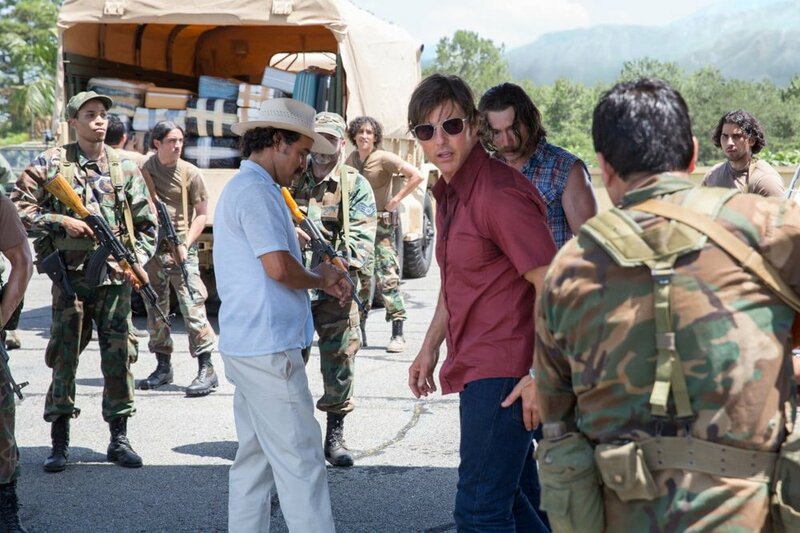 While no film has been quite as successful or biting as Scorsese's epic, there have been several quality films coming with the rise of true-story based films on capitalist American excess, with The Big Short, War Dogs, and now American Made telling stories with similar circumstances and economically-driven insanity. Doug Liman and Tom Cruise return for a second go around here, as once again Cruise plays a scummy weasel who is forced into the obviously impossible choice of working for the CIA or going to prison. Of course, events escalate quickly from there, and we have a wacky dark comedy that's both hilarious in its events, and terrifying in its implications. The film's narrative goes in depth with the different contacts that Barry delivers to, and as he gets involved in more and more deliveries of the not-as-legal nature, he relishes the adrenaline almost as much as he relishes earning more cash than he can safely store. Liman and Cruise do a good job of portraying Barry's character, as the audience roots for him in spite of his increasingly unethical behavior, as this behavior is reinforced both by his CIA contact and the people he delivers to. While the film does drag a little bit, it is based on true events. There is an overabundance of characters, as the film is best when it focuses on Barry and his interactions with his various contacts, but the side characters presented are not as strong or likable. Despite some unnecessary fat that could have been trimmed, there are a lot of guilty laughs to be had here, as the dark comedy is consistently surprising and effective, and Cruise proves once again that Liman's direction compliments his acting abilities greatly. In Edge of Tomorrow - or Live Die Repeat if you watched it on DVD, when the studio renamed it to that title - Cruise, directed by Liman, played a cowardly man who kept constantly trying to run away from battle. Here, he plays a slightly different kind of dirt-bag. While he portrays the character as that of a reckless outlaw smuggler, he genuinely enjoys getting his hands dirty and performing riskier and riskier tasks, as his smile widens with each subsequent harrowing drug or gun odyssey. When Cruise acts, and doesn't just run around in his films and yell and gawk, he's incredibly charismatic, and thankfully, Liman knows this, and he gets the most mileage out of the actor that he can. Supporting performances were pretty decent, with Domnhall Gleeson playing against type as a conniving, cunning CIA agent as a standout. But this film is Cruise's show, and he carries the film even through the slowest scenes with grace. Doug Liman's directing continues to show versatility in style. From directing a blockbuster-influenced sci-fi spectacle in Edge of Tomorrow, to directing contained military thriller The Wall, to this film, a political dark comedy. From the opening title sequence, Liman lets the viewer immerse into the time period, with music and visuals to match the late '70s and different songs throughout the film signifying time skips and progression. It's almost a cliche in how the soundtrack compliments the events of the film, as it's been done time and time again, but for good reason: it's a guaranteed way to embed a tone of Americana into a period film. The cinematography is decent, with the use of film providing good enough visuals to carry the story, but nothing is exemplary or particularly standout. All in all, this just provides another example of Liman transforming himself in chameleon fashion to fit the cinematic context at hand. American Made adds yet another good addition to the recent wave of true story American crime films. It doesn't particularly reinvent the wheel or offer anything the experience cinemagoer has not seen before, but it's funny enough and Cruise's performance is entertaining enough to carry the viewer through the film. It's no Scorsese or Tarantino style statement on the nature of crime and punishment through constant tension and spectacle, but it has enough ingredients to at least be a good time at the movies. If you're a fan of Cruise, Liman, or if the true story interests you, I'd recommend seeing it. If you're like me and you just wanna see how absurd true stories can get in the vein of The Wolf of Wall Street, you'll find a good bit to like here.